Lindsey Strang is an associate in the antitrust group of Axinn’s Washington, DC office, where she focuses on mergers, antitrust litigation, government investigations and counseling. She has advised clients in industries including healthcare, telecommunications, IT and automotive. Lindsey attended The George Washington University Law School, where she was a Dean’s Fellow, Writing Fellow and an Associate Editor of The George Washington Law Review. 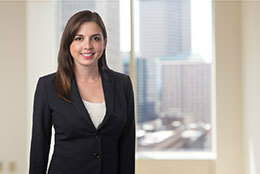 Prior to law school, Lindsey served as an immigration law clerk and paralegal. She holds a BA in Literature from American University.